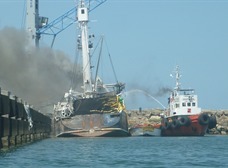 The fishing vessel Lautaro exploded into flames while docked in the harbor in Manta, Equador. The vessel was loaded with 60,000 gallons of diesel and 1,200 gallons of gasoline and was preparing to sail to fish for tuna. The fire and explosion was in the engine room. Sparks from a welding torch fell onto a canister of acetylene. Firefighters were called in and were able to bring the fire under control. Seven men, crew and firefighters, suffered injuries fighting the blaze. 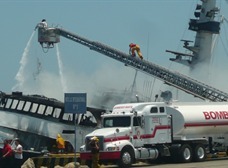 Reports state the fire destroyed much of the superstructure of the vessel.